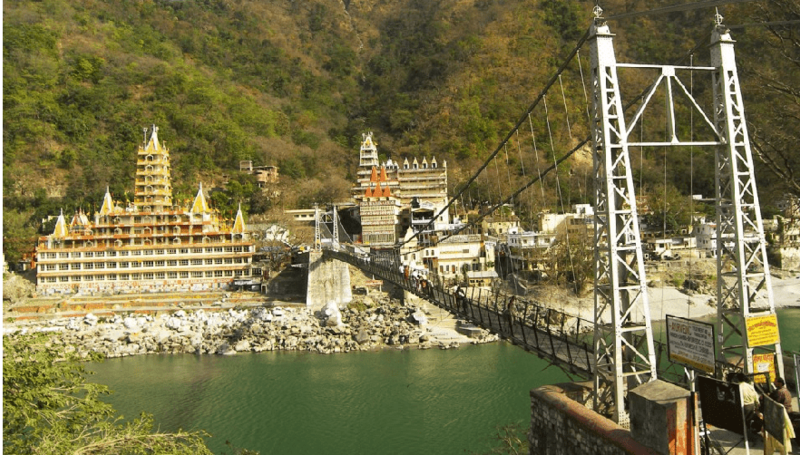 Lakshman Jhula, the Popular 450 Feet Hanging Bridge situated at the height of 70 feet from the Ganga river, is about three kilo meters away from the Holy place Rishikesh. 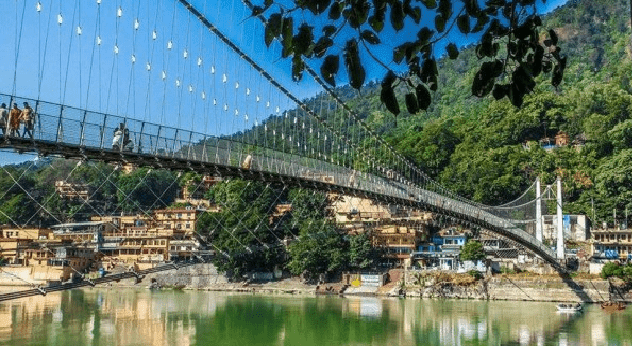 It is an adjoining bridge, built across the River Ganga and a path to reach at the holy land of Kedarnath and Badrinath, to the holy shrines of Lord Shiva. There are lots of reason behind the popularity of the Lakshman Jhula, and popular one among them is an ancient mythological tale about the Lord Lakshman (Cousin of Lord Rama), who has crossed river Ganga through a bridge made of Jute from the same site and from that time that bridge came to be known as Lakshman Jhula. We don't know, this is true or not, but the second reason is true for sure. The another reason behind the popularity of Lakshman Jhula is the architectural design of that bridge. In 1939 the bridge was reconstructed, and on the same path, a new Iron Bridge was built. There is no support given to the bridge from downside and is backed by thick metal wires. With the arrival of heavy wind the bridge fluctuates due to lack of base support and acts like a Jhula(Indian term), the vehicles passing through the bridge feels those fluctuations. And because of its architectural design, that bridge has now become a centre of attraction and millions of people come to see that bridge every year. Over the time there are lots of other traditional stuff built around that bridge. A Thirteen Story Temple known by the name of "Terah Manzil" is also popular among the visitors of Lakshman Jhula and from the top floor, you can have a great view of surroundings. There's a local market that has come to be developed around it. There is another temple known as "Lakshman Temple" around the Jhula with Risha Kund. There is a mythology about Lord Rama with his Cousin Lakshman took a bath in that kund after killing Ravana, to get rid of their sins.